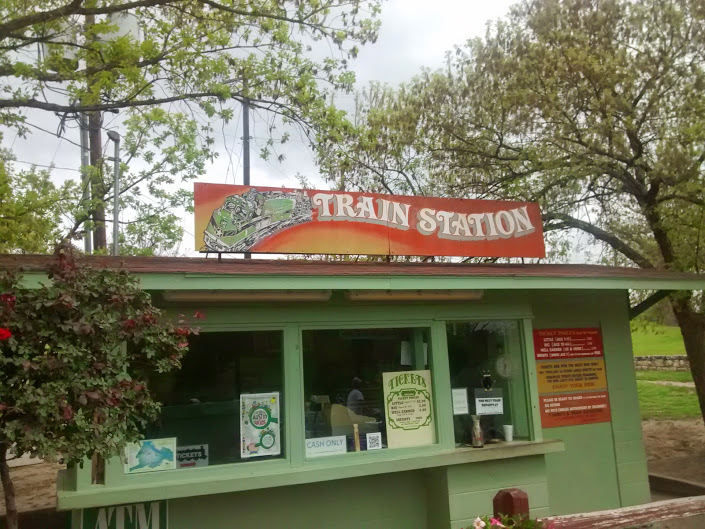 With a central location in Zilker Park, a ride on the Zilker Zephyr is a must-do Austin activity. Parents and children can while away the hours of the day in Zilker Park with swimming at Barton Springs, playing soccer on the fields, playing in the park (there’s a cool old fire truck for the kids to climb on! ), and picnicking in the park. Somewhere in between all of that fun, take a 20-25 minute a ride on the Zephyr for a scenic look around the park and an Instagram-worthy shot or two of Austin. Hours: Monday through Sunday, from 10 a.m. to 5 p.m. The train leaves every hour on the hour through the week and departs every 30-40 minutes on the weekends, weather permitting. Cost: Children: $2.00 (Children under 1 are free), Adults: $3.00. Cash only. Just Train Fun operates trackless trains complete with bells, smoke and whistles at three Austin-area malls. Train rides last between 8-10 minutes. Be sure to check the website as the locations at the Domain and Round Rock Outlet Malls operate when weather permits. Cost: Each ride ticket costs $5. For every two tickets purchased, one is FREE! Adults and kids (except for kids under 1 year old) need a ticket. Tickets can be purchased in the self-serve kiosk. Tickets do not expire and are accepted at all three locations. The depot for Austin Steam Train is located in Cedar Park and takes you on a journey through time in lovingly restored cars, pulled by a 1960 Alco diesel locomotive. Austin Steam Train offers many themed rides throughout the year including Father’s Day Flyer, Super Hero Flyer, The North Pole Flyer, Pumpkin and Halloween Express, Princess Flyer, Murder Mystery and a Wine and Beer Flyers for the grownups, and a special Day Out With Thomas Event. Hours: The Hill Country Flyer is a 66 mile round trip journey that takes you through the Hill Country with a two hour layover in Burnet. The total ride is 6 hours, departing at 10 am and returning at 4:00 pm. The Bertram flyer takes you on a 44 mile round trip journey that spans the South San Gabriel River and stops for a 15 minute layover at the historic Bertram Depot which features a fully restored operator’s bay, vintage operating equipment and historic photographs. This ride is 2.5 hours round trip with a 20 minute layover. departing at 10:00 am and returning at 12:30 pm on Saturdays with an additional option on Sundays, departing at 2:00 pm and returning at 4:30 pm. This train drives twice in a loop around the property. There’s not much to look at in this loop, other than the amusement park itself and the parking lot. 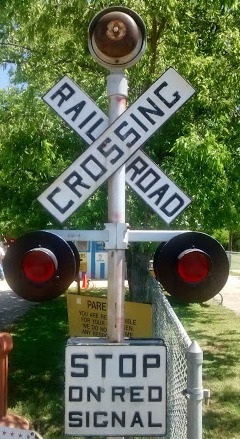 But the bonus for the kids is the real railroad crossing sounds as you pass by the parking lot. Kiddie Acres offers additional rides for the kids including mini-airplanes, boats, a small Ferris Wheel, pony rides, and more. Hours: Closed on Mondays; open year-round, weather permitting. Cost: Admission is FREE; train rides cost $4.50 each. Each ride in the amusement park requires at least one ticket. Discount Day is every Wednesday and there is a coupon available here. The train ride consists of a scenic ride through the hill country lasting about 20 minutes. Some of the zoo’s off-display animals can be observed from the train as well, including emus, alpacas and longhorns. The ride can be somewhat interactive with your kids as the Zoo has placed art and items throughout the property. The train is covered so it would be a pleasant ride in the summer since the sun is partially blocked from shining directly down on you and your kiddos! Tip: Pack a lunch! Outside food is allowed and there are plenty of picnic tables. The concession stand is only open on weekends. The train runs at the top of each hour from 11 am to 3 pm; 5 pm on Saturdays and Sundays. 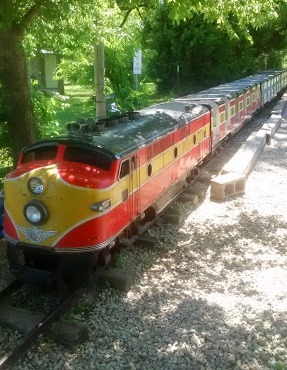 The Cedar Rock Railroad is a fantastic quarter-scale train that takes passengers on a relaxing 1.3 mile ride through the nature-filled fields and forests of the park… unforgettable fun for all ages! There are picnic tables, snacks and drinks available in the Shady Oak Junction Depot and a play area with a wooden train set to play on. Note: There are no convenient restrooms at this location. Essentially, if you or your kids have to go, you have a good walk or a short drive to the nearest restroom. Hours: Closed on Mondays, open Tuesday through Sunday year round, weather permitting. Train rides depart every half hour on the :15 and :45. Cost: Tickets are only $2.50 per person, kids 1 and under are free. Landa Park in New Braunfels offers a plethora of activities for the family including swimming pools, miniature golf, boats to rent in the lake, playscapes, picnicking spots, b-b-q pits, walking and jogging trails, fishing pier and much more! In addition to the above, there is also a miniature train to ride! While in the area, be sure to take your train lovers to the New Braunfels Railroad Museum, located in downtown at 302 West San Antonio Street. The museum has a locomotive, caboose, dining car, box car, model railroads on display. It is also conveniently located right next to one of the busiest North/ South railroad tracks. The tracks run the Mexico to Canada route and has over 30 trains passing by each day! Kids Fun Day at the Museum happens on the first and third Saturday of each month. Kids ages 18 and under get to run the model trains! The MetroRail is great option when your kids want to ride a real train! As a mom always being the driver, I loved the fact that I could sit back and be a passenger. I felt like I was riding through a new, unknown city, which made it an adventure for the entire family. The trains are clean, comfortable with a couple of tables in the very front that are perfect for playing a game of cards while traveling to and from. Be sure to have your kids use the restroom before riding as there are none available on the train. Tip: Arrive early enough to get tickets. Both machines at the Howard Station were in use when we arrived so we not only had to wait for those people in front of us to finish up but then also add in some time to figure out which tickets we needed. We had a couple of high school students with us who qualified for lower fares, but in the end, a Day Pass seemed to be the best option. We missed that train and had to wait for another half an hour for the next one to arrive.